Students leave Marjory Stoneman Douglas High School Wednesday. Washington – The school shooting in Parkland, Fla., has renewed the debate, which splits along partisan lines, over mental health and guns. It also has opened a debate on whether more states should do what Connecticut was first to do — pass laws that allow the confiscation of weapons from those who are believed to be a danger to others and themselves. President Donald Trump and other Republicans largely responded to the latest massacre in Florida by saying more should be done to get people who need it mental health care. 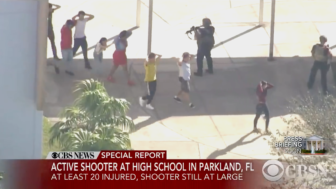 “So many signs that the Florida shooter was mentally disturbed, even expelled from school for bad and erratic behavior. Neighbors and classmates knew he was a big problem. Must always report such instances to authorities, again and again!,” Trump tweeted. But the president and other Republicans did not say more should be done to keep weapons out of the hands of the mentally ill. In fact, one of the first laws Trump signed into law abolished an Obama administration rule – implemented because of the Sandy Hook shooting – that required the Social Security Administration to submit information about mentally impaired recipients so they could be added to a list of people barred from purchasing a gun. Civil libertarians and disability advocates also opposed the Obama rule. Every year, congressional Republicans include a “rider,” known as the Dickey Amendment, in must-pass spending bills that prohibits the Centers for Disease Control and Prevention from conducting any research on gun violence and its impact on public health. Breaking from other Republicans, Gov. Rick Scott of Florida on Thursday said he would call on state lawmakers and law enforcement authorities to keep firearms away from the mentally ill.
Nikolas Cruz, who confessed to killing 17 students and faculty at the Marjory Stoneman Douglas High School, had a history of troubling behavior and mental health problems but was able to buy an assault rifle similar to the one Adam Lanza used in the Newtown massacre. Lanza obtained his weapon from his mother’s gun collection. Only a handful of states — Connecticut, Washington, Oregon, Indiana and California — have state laws that can be used to temporarily take guns away from people whom a judge deems a threat to others or to themselves. In 1999, Connecticut became the first state to pass a “red flag” law granting law enforcement the clear legal authority to temporarily remove firearms from individuals when there is probable cause to believe they are at a significant risk of harm to self or others. In 2016, Connecticut’s General Assembly also approved a bill, which Gov. Dannel Malloy signed into law, that requires gun owners to surrender their firearms within 24 hours of being served with a temporary restraining order in domestic violence cases. Lawmakers in 18 other states — including Florida — have proposed “red flag” measures. Everytown for Gun Safety, a gun control group founded by former New York Mayor Michael Bloomberg, said mass murderers often display warning signs before committing violent acts and “red flag” laws could prevent future massacres – as well as suicides and other types of gun violence. But restricting gun ownership to the mentally ill raises civil rights issues, and finding the right response to the Parkland shooting that would make the nation’s schools safer will not be easy. On Friday, Rep. Joe Courtney, D-2nd District, joined all fellow Democrats on the House Committee on Education and the Workforce in asking the panel’s chairman to hold a hearing on school shootings. Courney also said it is “GOP hypocrisy” to focus on mental health in the wake of the Parkland shooting, while cutting funding for mental health services and weakening the system that bars certain mentally ill people from purchasing a gun.